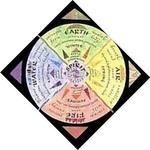 "The Rule of Three (also Three-fold Law or Law of Return) is a religious tenet held by some Wiccans/Pagans. It states that whatever energy a person puts out into the world, be it positive or negative, will be returned to that person three times"
This is Religion- and it is a "Guilt factor"
Most people worry about Bad Karma- than actually accruing "good karma"
No "Go" and No "Return"
It is the *Will* of the magickian which "'taints or colors the magick"
So who is keeping score or keeping track of our "karma good or bad points"...? Each of us? ....or some hidden god --who creates violent Nature outbursts... but watches to see if we defend our self or run away? So will our own, true self... "rat" us out? ...Is our true self a 'snitch'? It feels like some negative influences or karma are automatically eaten or taken out of the picture by being still and having an active LDT and MDT. I have a TON of work to do to get rid of the fear. I had to call my gf and vent earlier. Drove to see my mom, and somehow the coversation led to her saying she was prejudice, against 'islam' because they are taught to 'slaughter christians' and no religion should teach to kill people. I asked her if she was ignoring the entire history of 'christianity'. Tainted with hundreds, and if going back to biblical times, thousands of years of slaughtering any differing religions etc. Back to Abrahams time, move In and slaugher the heretics worshipping the false gods and demons. Go to all of South American continent and wipe out the devil worshipping Heathens. Are we going to ignoring your entire history? Sweep it under the mat and forget about it? Yes, Islamic may be killing christians aka you mEan 'infedels' ? In the recent past? Be how far back and for how long did the blood shed go on in Christian history? Also, at the root of Islam is abrahamic no??? I want to be at the position of leader to myself as god, and thus the follower to myself as god. To play the role of god for my own morality and ethics. This is an important aspect for me to be my own god! I've been working towards this, but the reprogramming has been difficult. I'm psyched if WarFare Magick helps me work towards this! "our attitude [which is a sum of our judgements and previous experiences] - is either Defense or Offense" not sure which of these is positive or negative.. love based or fear. I was thinking about fear the other day and came to some ideas, which may be incorrect or differing from what is said here but resonates with my current understanding (let me know what you think about this): we either accept fear (be responsible by acting on it like guarding yourself when you sense danger) or you ignore fear (out of faith? like when you sense danger from a direction and look THE OTHER WAY). Responsibility seems like a positive virtue that can be cultivated and seems to be about accepting fear and not ignoring it... Maybe I'm on to something? Maybe I'm wrong? Maybe others use different semantics? What do you think about this idea though? Regarding OP, karma seems similar to habit energy, so like when you have certain intentions or express an action.. You incur a habit energy- that spirit in action is now more likely to arise in the future.. like cultivating virtues or vices.. Thoughts? I mean what are Xing and Ming? One is said to be energy and one is said to be virtue.. perhaps this is daoist religion but is cultivating virtue not a thing? Jesus saves but Satan shares! The LDT seems to impart 'weight' when dealing with external sources that are pushing fear. It is much easier to remain grounded. I have been thinking about this alot the past few days. Basically the conclusion I got to is that we are going to have to re-calibrate our 'guilt factor' from being good people our whole lives so we don't trip ourselves up further down the road if/when we have must protect ourselves or whatever it is that calls for some 'darker stuff'. Personally I have never been in a street fight trying nor do I want to be. I always told myself if I ever got into a fight I would not blame myself for the consequences because if I end up in that scenario it was unavoidable. Does a Samurai feel remorse after he kills an assailant who first tried to take his life? No, he does what needs to be done. Prey vs. Predator is what nature teaches us and we are no different. i am much in line with this concept of cause and effect. reminds me of seth material, once again. i believe in basic benevolence of the human being. yet, nature as well as humans can be cruel, too. i always liked the idea that some of the most realized saints and buddhas, boddhisattvas, mahasiddhas have been criminals, gangsters, or killing on the battlefield. like padmasambhava liberating his enemies from suffering with his sword. and were in the moral grey zone quite some. it is not the acts, it is the judgement. there is also something natural like killer energy. integrating even predatory aspects seems a good idea to me to become more complete. magick is a good way to do so without acting them out and harming others. LMP Warfare Magick, where do I sign up? It's time for the pendulum to swing back. I know this is a ridiculous necrobump but I just love this thread and seems to relevant to the recent fear/doubt outbreak. This bump is awesome, ever relevant, thank you sis. you know it's going to be good! Good bump! Thank you sister it was an amazing read ! Literally the first thing that came to my mind reading this thread was a quote from Silence of the Lambs that to paraphrase, "he did this to her face *shows picture* and his heart rate never rose above 60." Superman, German Übermensch, in philosophy, the superior man, who justifies the existence of the human race. “Superman” is a term significantly used by Friedrich Nietzsche, particularly in Also sprach Zarathustra (1883–85), although it had been employed by J.W. von Goethe and others. This superior man would not be a product of long evolution; rather, he would emerge when any man with superior potential completely masters himself and strikes off conventional Christian “herd morality” to create his own values. Zarathustra presents the Übermensch as the creator of new values. In this way, it appears as a solution to the problem of the death of God and nihilism. If the Übermensch acts to create new values within the moral vacuum of nihilism, there is nothing that this creative act would not justify. Alternatively, in the absence of this creation, there are no grounds upon which to criticize or justify any action, including the particular values created and the means by which they are promulgated. One must have the strength of the Übermensch in order to will the eternal recurrence of the same; that is, only the Übermensch will have the strength to fully accept all of his past life, including his failures and misdeeds, and to truly will their eternal return. Above all, the Ubermensch is the next step in human evolution. Every human must deal with the question "What is the meaning of life"- some say God and Heaven, others say ultimate objective virtue, but the Ubermensch will give life value that is not based on superstition or mystical folly. The Ubermensch finds value in his life experience.